Summer picnicking. Summer concerts. Summer markets. Summer patios. Summer wines. All things I treasure about this time of year. 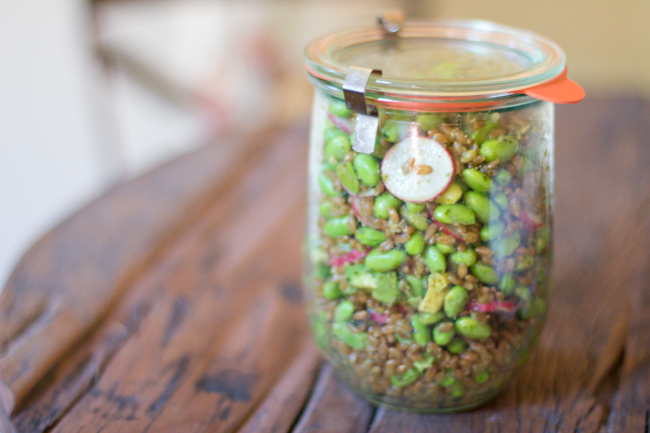 This recipe for Pesto Farro Salad is a powerful salad with edamame, avocado, and radishes. I deem it perfect for a healthy summer side for a picnic, concert basket, patio meal, or wine pairing. In fact, we took it on a picnic at the park just this past weekend, then I ate the leftovers the preceding night while I sat on our front porch sipping on some Calathus Charddonay from Argentina. My ingredient of choice these days has been avocado. For some reason it is just hitting the spot right now. I’ve been smashed avocado on toast with cracked sea salt in the mornings and a salad (something similar to this one) avocado in the afternoon or evenings. I even put avocado in a chocolate ice cream recipe this week… more on that soon! Bring about 4 cups of water to a boil with a dash of salt, add the cup of farro and bring to a simmer. Cover and let simmer for about 30-40 minutes or until the farro is chewy and tender. (If you like farro even more tender and less chewy, you can soak it for a few hours before cooking). 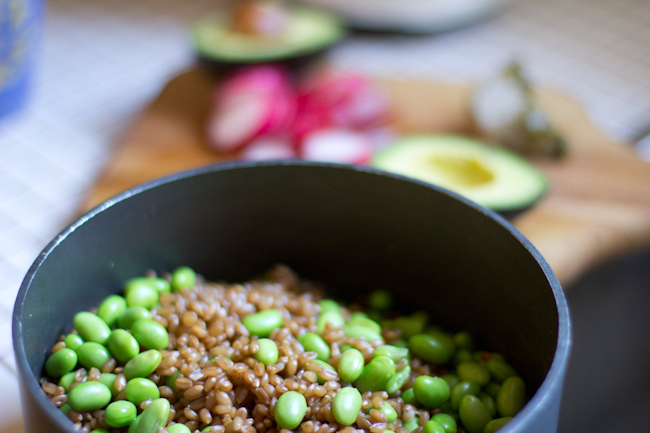 During the last 10 minutes of cooking the farro add the edamame. Cook edamame until still slightly crisp. Drain edamame and farro, then toss with fresh or frozen pesto. 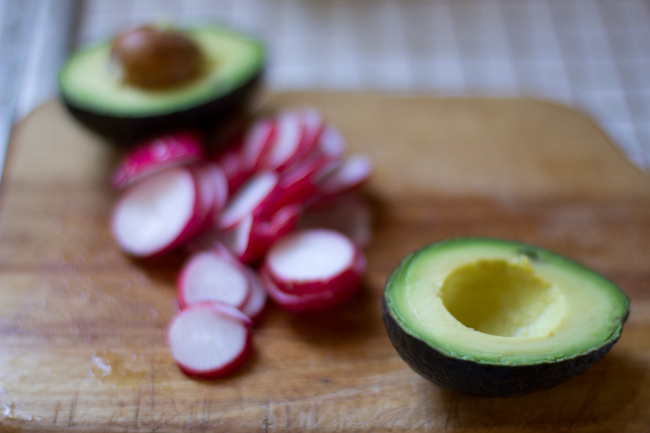 Slice radishes and cut avocado into small cubes. Add radishes and avocado to farro mixture. Season with salt and pepper to taste. I have been addicted to avocados, lately, too. I thought it was a pregnancy thing, but maybe it’s just the time of year!! They are especially good right now I think! I like the way you picnic! I don’t know how I missed this salad but it looks wonderful. Perfect for taking to a evening concert or picnic in the park!